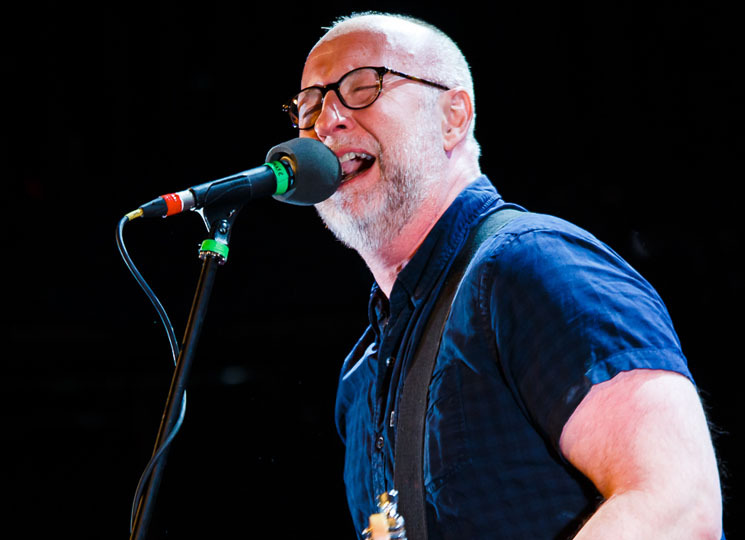 With his most recent appearance in Toronto, Bob Mould seemed determined to cut through his own legend. Performing with a single mic, amp and electric guitar (which he carried out to the stage in its case himself) the former Hüsker Dü and Sugar member and current solo artist worked through songs across his vast, four-decade catalogue to a seated crowd of fans. "Thanks for coming," he said. "This should be fun." Yet, from the opening chords of Sugar's "Hoover Dam," Mould's performance transcended the rather aged setup. Clearly enjoying himself, Mould was affable in between selections, eager to chat with the crowd of onlookers while frequently tuning his guitar. That contrasted with the fury he displayed while playing. With spittle visibly flying from his mouth, his voice soared over the distorted chords of songs like "See a Little Light" and "I Apologize." Even during the instrumental breaks, Mould would rock out as if he were playing with his usual power trio. This was middle-aged rage at its best. The format laid bare the continuum that runs across the singer-guitarist's catalogue; though Hüsker Dü ("Flip Your Whig") and Sugar ("If I Can't Change Your Mind") cuts received rapturous receptions, his solo material — both old and new — sat comfortably alongside those classics, and were warmly received as well. Portions of the evenings proceedings were being donated to Planned Parenthood, and Mould engaged in some political stumping, encouraging everyone in attendance to get involved in politics locally. But even he admitted that, being north of the border, he had less vitriol than usual to let loose. Nevertheless, 1982's "In a Free Land" was a fitting end to his main set. He returned for a two-song encore, first offering up Hüsker Dü's version of "Love is All Around," the theme song to The Mary Tyler Moore Show, and originally the B-side to "Makes No Sense of All," which closed out the night. Even in trying to subvert the mythos around him, Bob Mould can't help but add to it.